Make no mistake about it, horse riding can be dangerous. 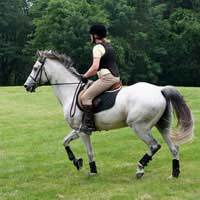 Having said that, there are plenty of measures which can be taken to reduce the risks posed to the rider every time they mount their horse. Everyone who starts to ride knows how important riding hats are but fewer remember that the back is just as vulnerable as the head, particularly in the event of a fall. Backs should be protected as well as possible, and, especially if there is an old or recurring injury, should be supported while riding. Body protectors protect more than just the back; they look after the whole of the upper torso. Whatever level you are riding at, a body protector is an important addition to your equipment. When you are buying a body protector, fit is vital. You should look for a snug and comfortable fit. Interchangeable fronts and backs are available so that in the event of damage, you can change the relevant part rather than the whole thing. Shoulder straps should be adjustable so you can tighten or release them if you gain or lose any weight. Any radical changes though, and you should buy a new body protector, to make sure it fits perfectly. Always look for the BETA standard on any body protector you buy. This is the standard recommended by most horse clubs and associations, and, indeed, stipulated by many competitions and shows. The protectors themselves come in classes and levels. There are three levels, which are dependant on the size and weight of the person. A higher level does not always afford more protection. For example, a child riding regularly wearing a level two protector is given as much protection as an adult jumping wearing a level three. Level one is really only suitable for children beginning to learn to ride. To work correctly they, must be fitted properly. BETA standard protectors have size charts in them showing exactly where to measure. You will need your waist, chest and waist to waist over the shoulder measurements. Don’t forget when trying a protector on to try it on over your riding clothes as it is important to get a good fit with them. Also simulate the riding positions you use to make sure it is comfortable in all of these. It is best to visit a properly trained retailer for a proper fitting. The protectors do not protect the spine itself but what they do is cushion the impact of any fall on your back. Level 1 – A low level of protection, not suitable for most riders apart from small beginners and children. Level 2 – The most appropriate level for most children and inexperienced riders. It is a low risk level and should not be used if you are planning to jump or ride on hard surfaces such as roads. Level 3 – Suitable for most normal riding and should be worn in most conditions and always in competitions. Injuries to the back can affect you forever, so it is important to support as well as protect your back. When riding a horse, you are asking your body to keep an upright position for long periods of time with nothing to lean back into. Good posture is vital, but even with a perfectly straight back, pain can occur. A back supporter can alleviate some of this pain. When choosing a back support it should be tight fitting as it is important that it does not restrict your movement or it could end up hindering more than it helps. A lightweight one, made of a material which lets the skin breathe is also important. In riding, safety is paramount and the back is vulnerable. It can get overlooked when new riders are considering safety measures, simply because it is not as visible as the head. But it is vital to get a properly fitted protector and, also importantly, replace them after any damage occurs or any fall – even if the damage is not visible. You never know what has been compromised underneath. For frequent riders, a body protector is far from being a useful add-on, it is as important as a hard hat. I having been taking riding lessons for about a month and I have found that when I go into two-point position, my back hurts a little, and the next day the pain is unbearable. Should I start wearing a back brace?